Separate broken slivered almonds and choose only unbroken pieces. Place vanilla frosting in a piping bag. Pipe circles of frosting on top of the cookie for eyes (about 1-inch in diameter each). Place 1 Werther's Original candy on top of each circle frosting. Pipe a small amount of frosting on top of the Werther's, and then place 1 chocolate chip on each eye. 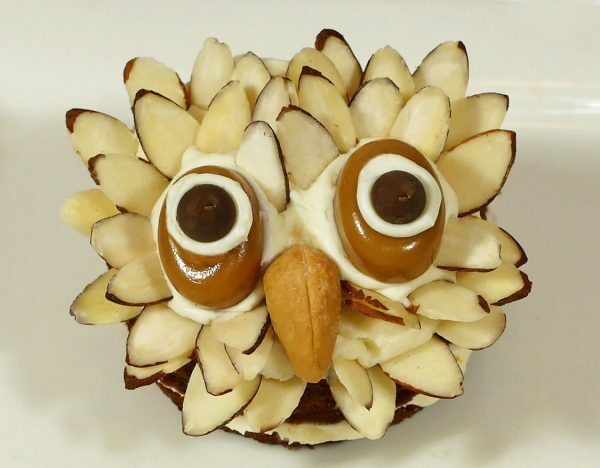 Attach the slivered almonds (sticking up out of the frosting) around each eye, forming a circle. Create a second circle outside the first. Create a third circle. In the center toward he bottom, place a cashew in the frosting, the wider end at the top.